Portland’s light rail system runs about every 15 minutes most of the day, every day. Service is less frequent in the early morning, mid-day and evening. 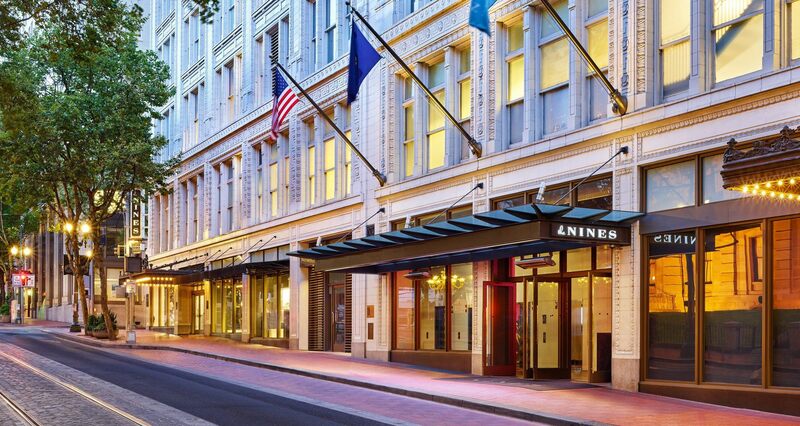 Catch the MAX from Portland International Airport and pay only $2.50 for a 40-minute ride to The Nines Hotel. Exit at Pioneer Courthouse Square. TriMet buses serve much of the Portland metro area. Many bus lines connect with MAX Light Rail, WES Commuter Rail and the Portland Streetcar. Contact our concierge for a bus schedule and rates. TriMet’s WES (Westside Express Service) is a commuter rail line serving Beaverton, Tigard, Tualatin and Wilsonville. WES runs every 30 minutes during the weekday morning and afternoon rush hour. The Portland Streetcar connects Northwest Portland, the Pearl District, Portland City Center, PSU, RiverPlace and the South Waterfront District. The Streetcar is owned and operated by the City of Portland. Our concierge team can assist with scheduling town car or private car service. You may call the concierge desk to schedule a vehicle or contact us here. The Nines Hotel is pleased to offer valet parking to our guests on a daily/overnight basis with unlimited access throughout the day and night. Short term rate of $19 for the first 90 minutes, then $5 per hour for each additional hour. Overnight rate of $49.00, $57.00 for oversized vehicles, and $37.00 for hybrid vehicles. For questions or for more information, contact us directly at 1-877-229-9995. Click on the link for driving directions to the Nines. Taxis are readily available at the entrance of the Nines Hotel. Please contact a member of our bellstaff if you would like to schedule taxi. The approximate cost from Portland International Airport to the Nines Hotel is $40.